The wedding lasso rosary is an item used during the vows of the wedding ceremony. 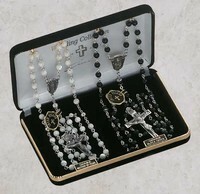 The large rosary consists of two loops, one of which is for the bride and other for the groom. The crystal rosary goes around the bride and groom in ceremony, drawing them together and uniting them in Christ. The sets consist of 2 pieces and make a great keepsake to look fondly upon during the years of marriage. The wedding lasso is traditionally draped around the necks of the bride and groom in a figure 8 or infinity pattern. The rosary symbolizes the lifetime unity or the everlasting union when they officially become husband and wife. It is also a symbol of marital protection and each loop formed signifies their love for one another. 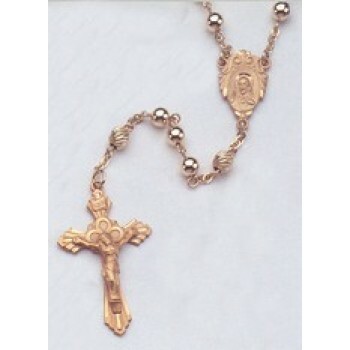 Use of a wedding lasso rosary is most common in Hispanic countries. Shop Matthew F. Sheehan for a variety of wedding lassos including stunning faux pearl and crystal designs. The gorgeous sets make excellent engagement gifts and we offer several styles that are pre-packaged in a handsome keepsake box for easy gift giving. Choose your favorite design today and participate in the sacred tradition of the wedding lasso.